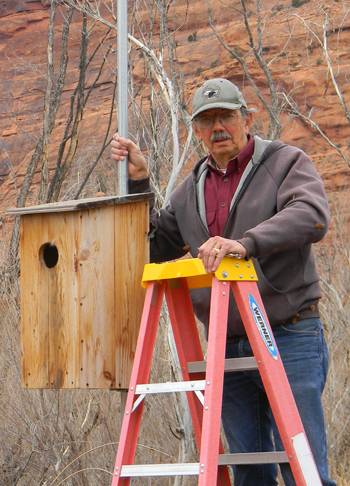 A DWR volunteer builds, places and checks nest boxes in southern Utah. On March 9, Tony Wright, Sensitive Species Biologist and Joe Cresto, a DWR volunteer, checked four wood duck boxes for eggs. They found that two of the boxes held eggs, promising another generation of wood ducks in southern Utah. Joe Cresto constructed and monitored nest boxes for wood ducks. One egg-bearing box was at the Moab City Pond, the other at the Scott M. Matheson Wetlands Preserve. The construction, placement and monitoring of these boxes has been Joe’s project. Joe retired from the BLM in Moab and now serves as a DWR volunteer. He was a career wildlife biologist and continues to support and conserve wildlife in his free time. Four years ago, he raised two boxes at the city pond and two at the wetlands preserve. Before the wood duck boxes were erected, there were few wood ducks at the city pond. Because these ducks are cavity nesters, nesting habitat was mostly unavailable at the pond. Cavities are most commonly found in stumps and dead trees, which are almost always removed from city parks. It was obvious that lack of nesting habitat limited population growth for wood ducks. 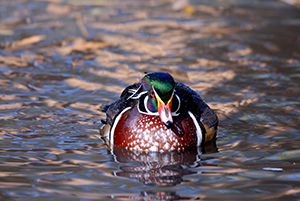 Brent Stettler snapped this photo of a male wood duck. Since the boxes were constructed, wood duck pairs have successfully produced young. With eggs being laid this year, we can expect a new generation of wood ducks this spring. Typically, ducklings that hatch and fledge from a given area return as adults to nest and rear young. Habitat improvements, like the installation of nest boxes, are making a growing population possible. Wood ducks are among the most beautiful and celebrated waterfowl — not only in Utah — but in all of North America. I’d like to say thanks to Joe for his successful efforts on this particular project. Hello, We have wood ducks that live here at The Willows Condominium complex here in Murray and I haven’t seen babies in at least 5 years. Is it possible to do something like this for them here? I’d love to know how to ‘get er done’ as they say. I work for Murray City in the Parks department. Recently, we had eight acres burn along the Jordan River. We are currently putting together a plan for restoration and wanted to add nesting boxes to improve the wildlife habitat. Do you have plans for the boxes or a contact in Salt Lake that could advise us?